The ISO 3630 describes methods to examinat root canal instruments, torsional strength and torsional angle. The root canal instruments are tested for maximum torsional moment and a maximum angle of twist. No cracks or breakage may occur. The test device consists of the sample holder, the torsional and rotational angle sensor and the transmitter. A quick-clamp of the device under test allows simple to tighten. The tester performs the load automatically. By a motor with a gear , the required torque and the angle of rotation is generated. The test include also a micrometer scale, for setting deflection. In addition, a bending stiffness test can be performed. For this purpose, the sample is stretched perpendicular to the rotation axis and is bent by 45 °. The resulting torsional moment is measured. To test the torsional strength in the handle , the sample is to be charged to a torque of 360 g cm. 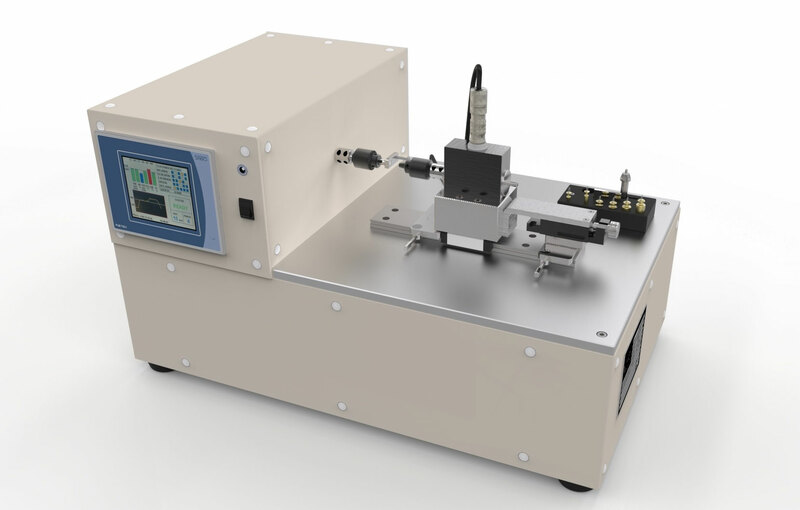 To test the safety of the handle and shaft for tensile strength please see == > Universal Test Maschine. Zeroing the torque , Approaching an angle of 7°, Approaching the starting position 0°, Approaching an angle of 9°, Approaching the starting position 0 ° + - 2°, Approaching an angle of 18 °. Due to the software of the controller, the parameters for max. Angle, speed or limit of the max. torque can be set to ISO or according to test wishes. Test sets can be created and selected. All tests of the ISO 3630 Part 1,2,3 have been filed in the software and can be selected. Due to the construction of the sample holder on a linear stage the quick and easy adjustment for different sample sizes is possible. The required torque, rotation angle, the turning speed and number of test cycles can be adjusted. By clamping the sample the torsionsensor is preloaded. The test apparatus is rotate the sample automatically until it is free of load before the examination. The break is automatically detected by the drop in torque and the associated angle output. The sample can also tested with a oscillating load. For the bending test ISO 3630-3 sequences can also be programmed. The software allows the entry of product-specific data (manufacturer, batch, composition, basic investigation, etc.) and data for testing (tester, date, location, etc.) a documented and transparent investigation. After completion of the investigation, the raw data and the calculated result is displayed and stored.